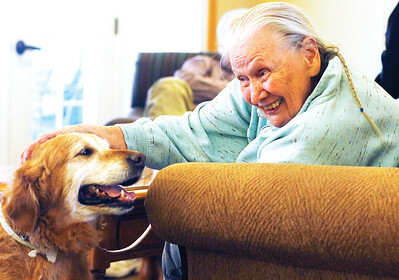 H. Rick Bamman - hbamman@shawmedia.com Fox Point resident Diana Zito visits with 14-year-old Assissi Animal Foundation therapy dog Abby during a visit on Friday, March 11, 2016 im McHenry. Assissi Animal Foundation was the first no-kill shelter in the county and the first to offer therapy animals, and is coming up on its 30-year anniversary of the program. 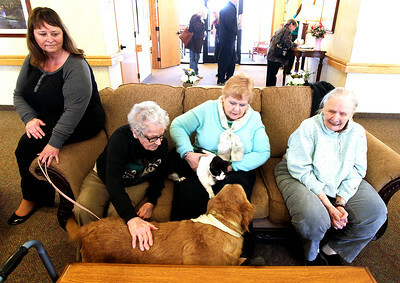 H. Rick Bamman - hbamman@shawmedia.com Assissi Animal Foundation volunteers Alane Doyle (left) and Carol Vazzano (third from left) visit with Fox Point residents Sophia Hansen (second from left) and Diana Zito (right) with therapy animals 14-year-old Golden Retriver Abby, and Bandit the cat on Friday, March 11, 2016 in McHenry. 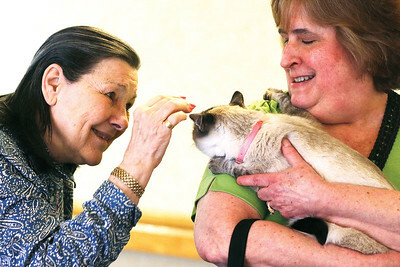 H. Rick Bamman - hbamman@shawmedia.com Fox Point resident Joan Dooley (left) greets Assissi Animal Foundation volunteers Debbie Thiem with Lily the Himalayan Siamese during a visit on Friday, March 11, 2016. 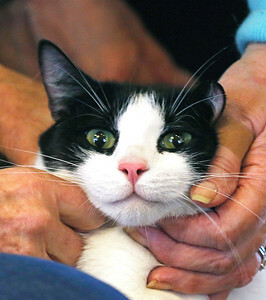 Assissi Animal Foundation was the first no-kill shelter in the county and the first to offer therapy animals. The Annual Benefit fashion show luncheon is on April 9 with emcee Nancy Loo of WGN-TV at the Crystal Lake Country Club. For more information call 815-455-9411. H. Rick Bamman - hbamman@shawmedia.com Assissi Animal Foundation tharapy cat Bandit enjoys the attention from Fox Point resident on Friday, March 11, 2016. 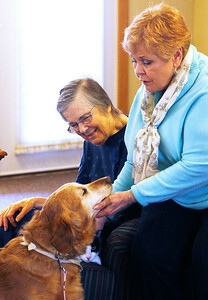 Assissi Animal Foundation was the the first to offer therapy animals in the county. H. Rick Bamman - hbamman@shawmedia.com 14-year-old Assissi Animal Foundation therapy dog Abby rests while Fox Point resident Patricia Young talks with Assissi Animal Foundation volunteer Carol Vazzano and Toni Gignac comes in the room to visit with the animals. Assissi Animal Foundation was the first no-kill shelter in the county and the first to offer therapy animals and will be celebtating its 30-year anniversary of the program. 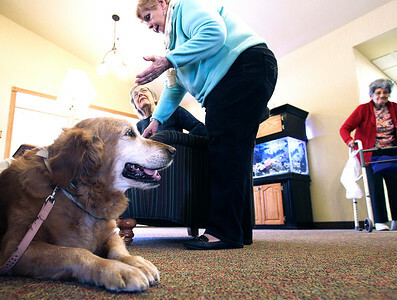 14-year-old Assissi Animal Foundation therapy dog Abby rests while Fox Point resident Patricia Young talks with Assissi Animal Foundation volunteer Carol Vazzano and Toni Gignac comes in the room to visit with the animals. Assissi Animal Foundation was the first no-kill shelter in the county and the first to offer therapy animals and will be celebtating its 30-year anniversary of the program.